I am not making this up: They're even half-finished (and they've been Ravelled) -- not bad for an afternoon's work! Just call it my ode to "cute culture." 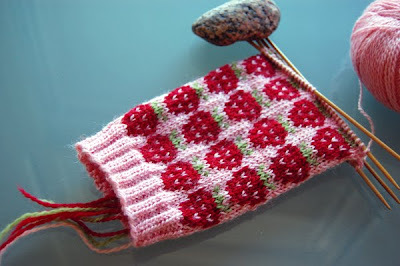 I need to see this strawberry motif on legwarmers. As for the next pair of mittens...well. They're on the way! They're distinctly darker in theme and motif and I love them already. I hope you will, too. February 8, 2010 at 8:05 p.m.
February 8, 2010 at 8:20 p.m.
Oh my goodness those are precious ... I would love to make myself some leg warmers with that pattern! Kudos to you! February 8, 2010 at 8:21 p.m.
February 8, 2010 at 8:28 p.m. I would totally knit legwarmers out of that pattern. If you need a test knit/tandem pattern let me know! February 8, 2010 at 8:34 p.m.
Oh, I love the strawberries. They'd be cute across a little baby sweater too! February 8, 2010 at 9:30 p.m. I love them!! winter needs more colourful, cheery cuteness. February 8, 2010 at 9:38 p.m. I really love the red and the pink together! February 9, 2010 at 12:01 a.m. So. stinkin. cute. It makes me want to dance among the wildflowers. I might knit a tiny strawberry to stick on a bobby pin and put in my hair. LOVE! February 9, 2010 at 12:14 a.m.
February 9, 2010 at 12:37 a.m.
February 9, 2010 at 12:57 a.m.
February 9, 2010 at 1:32 a.m. I love strawberries. It's a lovely pattern. February 9, 2010 at 2:21 a.m.
Makes me longing for strawberry fields and summer! February 9, 2010 at 3:47 a.m.
February 9, 2010 at 10:28 a.m.
February 9, 2010 at 6:56 p.m.
OMG I love these! I bet they'll look extra adorable with matching leg warmers. February 9, 2010 at 7:35 p.m.